Gunshow Loophole: Nearly everyone is on board with at least one of Obama's legislative proposals. President Obama yesterday laid out his legislative wish list on gun control, ranging from the reinstatement of a ban on the sale and production of assault weapons that expired in 2004 to closing the so-called “gun show loophole” that allows a large chunk of gun buyers to avoid a criminal background check by purchasing their firearms from private dealers, like from someone at a flea market or over the Internet. Just about everyone agrees with the idea — about 9 in 10 gun owners favor background checks as do people with no firearms in their home. Independents (95 percent), Democrats (93 percent) and Republicans (89 percent) all support a background check for those trying to buy firearms. No matter where people live: in the South, the Northeast, in big cities, in small towns. Even members of the National Rifle Association favor background checks. Only 7 percent of all adults in the survey, conducted Friday though Tuesday, oppose background checks for prospective gun customers. 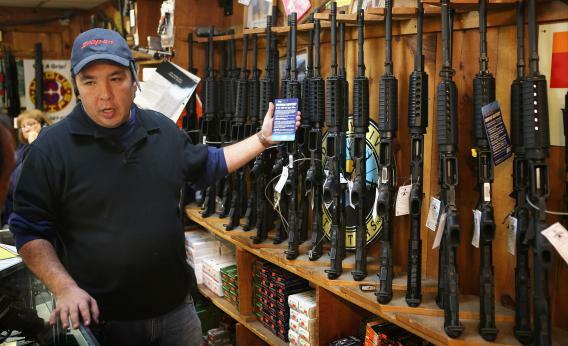 The Times reports that “nearly 40 percent of all gun sales are exempt from the system” under the loophole. The paper doesn’t cite where that figure comes from, but it appears to be a reference to a 1997 study by the National Institute of Justice on who owns guns and how they use them, the last major relevant study on the topic. As the Tampa Bay Times’ Pulitzer-winning fact-checking department PolitiFact explained last year, it’s difficult to know how much stock to put into that number given the study is 15-plus years old. * At the same time, current regulations don’t allow direct tallies of sales of this sort, so for now it’s the best figure anyone really has to work with. *Correction: An earlier version of this post misstated when the PolitiFact story was published. It was written in 2012, not earlier this year.